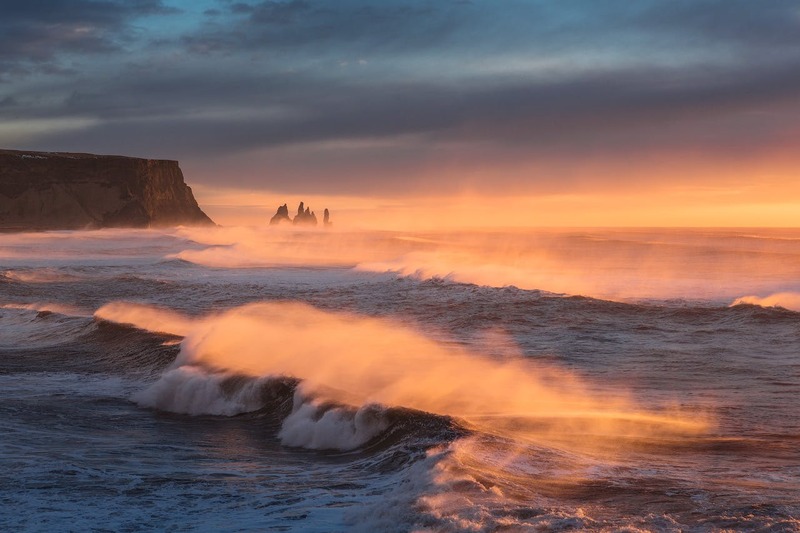 Join award-winning landscape photographers from Iceland on this 13-day Extreme Iceland Highlands Photography Workshop, and capture the country's South Coast, Highlands and Northern vistas. 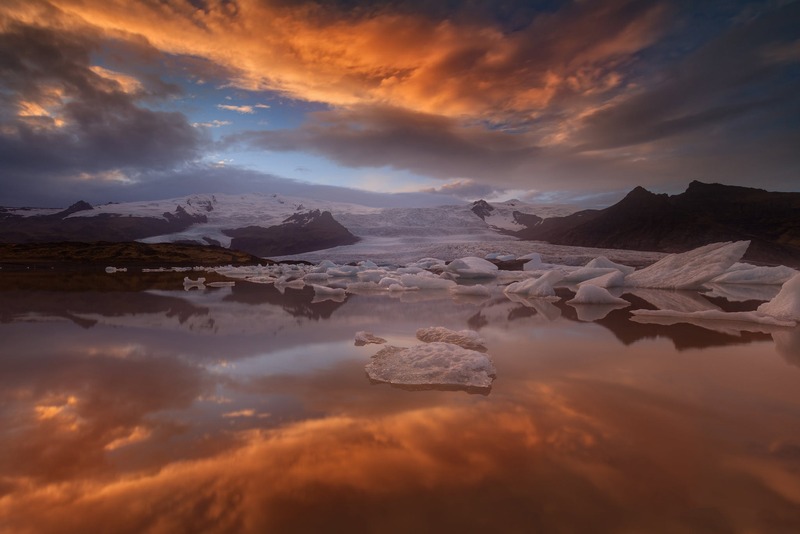 This ultimate itinerary explores prime locations for landscape photographers, such as the ice beach, the glacier lagoon and majestic waterfalls like Goðafoss. It also welcomes you to incredible landscapes of Highlands which can only be accessed during the summer. You will be travelling in a modified 4 x 4 vehicle to reach the great wilderness of Highlands safely. All your accommodation will be in hotels and guesthouses with private bathrooms. This is a great opportunity to photograph both the landmarks on and off-beaten tracks of Iceland while learning new techniques to take your photography skills to a higher level. Capture the beauty of the incredible Highlands and more. See the daily itinerary below and check availability by choosing a date. Eldgja is the largest volcanic canyon in the world, 270m deep, 600m at its widest and around 40 km long. The canyon lies paralel with the Lakagigar craters. The first documented eruption of Eldgja, in 934, was the largest flood basalt in historic time. A beautiful watefall, Ofaerufoss in the river Ofaerua falls into in the Eldgja canyon. This is a two-spilt waterfall and the lower part used to have a natural bridge, but the bridge collapsed in the early nineties. The Sprengisandur highland plateau stretches between the glaciers Hofsjokull and Vatnajokull (Europe’s largest glacier) and was the main route between the North and South of Iceland in former times. It stretches between the North and South at around 200 km, reaching a height of around 750-800 meters. The highland pass is mostly barren, with scant vegetation and is only passable during summer, and even then the weather can be unpredictable. It is accessible by car but it is a gravel road so a 4WD car is recommended. To the north one can drive over to Eyjafjordur, Skagafjordur and Bardardalur. South of Hofsjokull is the nature paradise Thjorsarver. En route you’ll have view of three glaciers: Hofsjokull to the west and Tungnafellsjokull and the mighty Vatnajokull to the east. To the southeast is the oasis of Nyidalur with excellent lodgings. Sprengisandur has strong connections with folklore and was a hiding place for outlaws in former times, the most famous being Fjalla-Eyvindur and his wife Halla, along with fellow outlaw Arnes, who resided at the southern border of Sprengisandur (ruins Eyvindarver bear witness to their stay). Already legendary, they were further immortalised in poet and playwright Johann Sigurjonsson's play Fjalla-Eyvindur, later made into a film by Swedish director Victor Sjöström. Poet Grimur Thomsen wrote a famous poem about Sprengisandur (A Sprengisandi = 'At Sprengisandur'), which was later set to music and is a highly popular song with Icelanders. Hveravellir is a geothermal area and nature reserve in the Icelandic highlands, between the glaciers Hofsjokull and Langjokull. The area features colourful sinters and smoking fumaroles, hot springs and a geothermal hot pool. 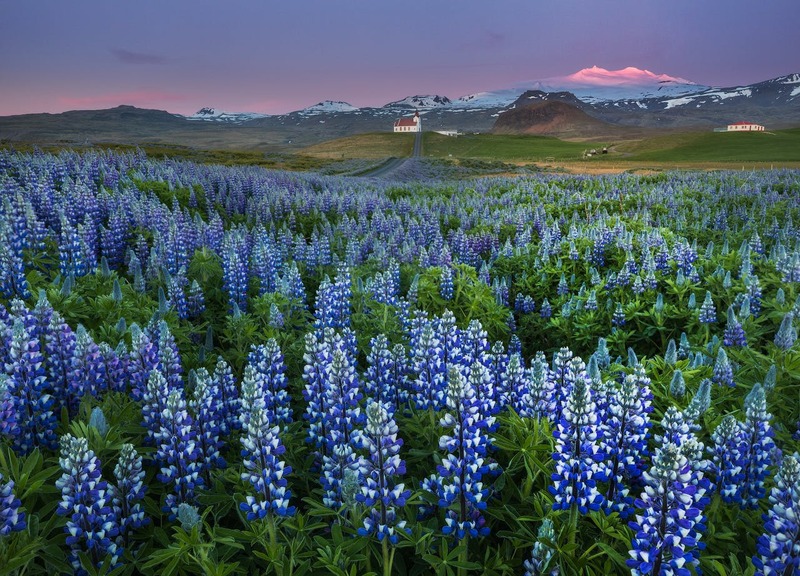 Hveravellir is renowned for its beauty and is a popular stop when traveling through the highland road of Kjolur. Fjallabak may refer to Fjallabak Nature Reserve, or two highland routes, South Fjallabaksleið or the North Fjallbaksleið. The name 'Fjallabak' literally translates to 'The Back of the Mountains', or 'Mountain Back'. Fjallabak Nature Reserve ("Friðland að Fjallabaki") is an area in the Icelandic Highlands surrounding the popular hiking destination of Landmannalaugar, protected since 1979. The entire area is more than 500 metres above sea level and characterised by colourful mountains, geothermal valleys and volcanic activity. The colour is due to the rhyolite and obsidian making the ground appear green, blue, pink, red and yellow. Lava fields, rivers and lakes also make their mark on this Nature Reserve. A popular natural hot spring is located at Landmannalaugar camping ground, where visitors will frequently bathe. A mountain hut is also found in the area, perfect for guests to book overnight stays, use the kitchen and the bathroom facilities. All amenities are basic and very rustic and there are no food or grocery shops available in the area. The area is most popular with hikers; to reach it a 4WD car is needed as some rivers need to be crossed. Fjallabak Nature Reserve is also only accessible during summertime, as it is covered with thick ice and snow in wintertime. Iceland's most popular hiking route, the Laugavegur Route, leads from Landmannalaugar within Fjallabak Nature Reserve to Þórsmörk. Hikers normally take 3-4 days to hike it. The South Fjallabaksleið ('Fjallabaksleið syðri') is an old highland route north of Mýrdalsjökull glacier, connecting Rangárvellir (the eastern part of the South Iceland lowlands) to Skaftártunga (the area northwest of Mýrdalsjökull). The area is very dry, sporting scant vegetation as it is situated between mountains that have a strong volcanic activity. The mountains have left endless amounts of ash, sand and lava in the area which is now covered in moss, creating a truly unique regional look. In more recent times, another track, North Fjallabaksleið ('Fjallabaksleið nyrðri'), has been laid, connecting the two aforementioned areas. This north track was originally named Landmannaleið by the local farmers who used it. Downstream of Dettifoss, Europe's most powerful waterfall, is another major waterfall, the thunderous Hafragilsfoss. Like Dettifoss, Hafragilsfoss is a part of the glacier river Jokulsa a Fjollum in North Iceland. Hafragilsfoss drops at 27 meters into Jokulsargljufur canyon. The glacial river Brúará falls 2-3m, ending in a U-turn at the base of the waterfall, where the river is concentrated into a deep crevice that runs through the centre of dark volcanic rock formations. This creates sky-blue rapids that almost defy the imagination—and the vistas are made all the more beautiful by the surrounding, lush green flora, which provides a stark contrast to the flowing water. Brúarfoss makes up just a small part of Brúará, whose origins lie in the mighty Hvita river which runs from the glacier Langjökull. Brúarfoss is found in the west of Iceland, roughly one hour and twenty minutes east of Reykjavik. The waterfall takes its name from a stone arch that once stood over it, acting as a bridge for those who wished to cross. According to legend, this natural stone bridge was destroyed in 1602 by a minion of the Skálholt episcopal see. At that time, Iceland was suffering a severe famine, and by destroying the bridge, the minion prevented the starving peasants from reaching the bountiful lands claimed by the church. On July 20th, 1433, the Danish bishop, Jón Gereksson, was drowned in the waterfall after being placed in a bag, tied to a large stone and thrown in. Though details are somewhat hazy, it seemed that Jón had, in a jealous rage, attempted to murder the lover of a young woman named Margrét Vigfúsdóttir. In return, she swore her heart to any man willing to avenge the murder attempt and, thankfully, the son of a chieftain, Þorvarður Loftsson, was there to oblige her. There has been much discussion in Iceland, concerning the steadily increasing stream of travellers who visit the area and trample its delicate natural landscapes. The walking path to the waterfall is on private property and is now closed to the public. This is due to disrespectful treatment of the path and littering in the surrounding area as well as the discovery of human waste and toilet roll in the foliage. This is a case of the few ruining it for the many and should serve as a reminder to always treat nature with consideration. Veiðivötn is an area of over 50 small fishing lakes, situated north-east of Friðland að Fjallabaki and Landmannalaugar. The overall area is approximately 20 km (12 mi) long and 5 km (3 mi) wide. These crater lakes of the area are best considered ‘desert lakes’, surrounded by tephra sands, and formed following violent eruption that occurred around 1477. This makes the region one of the youngest in Iceland, a natural oasis in the Icelandic Central Highlands. There have been over 57 species of bird observed in the area. The lakes are also thought to contain one of the oldest stocks of Trout in Europe and are thus highly popular for trout fishing. Amongst other species of fish that are found in the lakes are Arctic Char. A 4WD is considered the best choice for vehicles trying to access this region, given the gravel roads and uneven terrain. The roads accessing Veiðivötn are usually open from the middle of June to the middle of October, making it the perfect place to visit during the busy Summer months. Full board during workshop, from dinner on day 1 til breakfast on day 13. You will receive a list of necessary and recommended equipment to bring after booking. Please note that the tour is always dependent on weather, as the Icelandic weather can indeed be highly unpredictable. 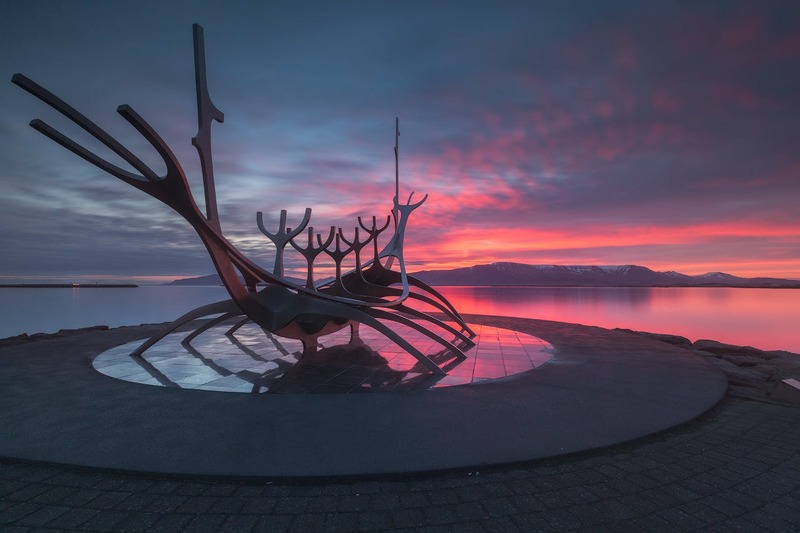 After landing at Keflavík International Airport, you'll take the FlyBus to your hotel in central Reykjavík. Your guides will meet up with you in the lobby at 19:00 and you'll go out for a nice meal at a nearby restaurant, where you‘ll get to know each other and go over the itinerary of the photography adventure awaiting you. 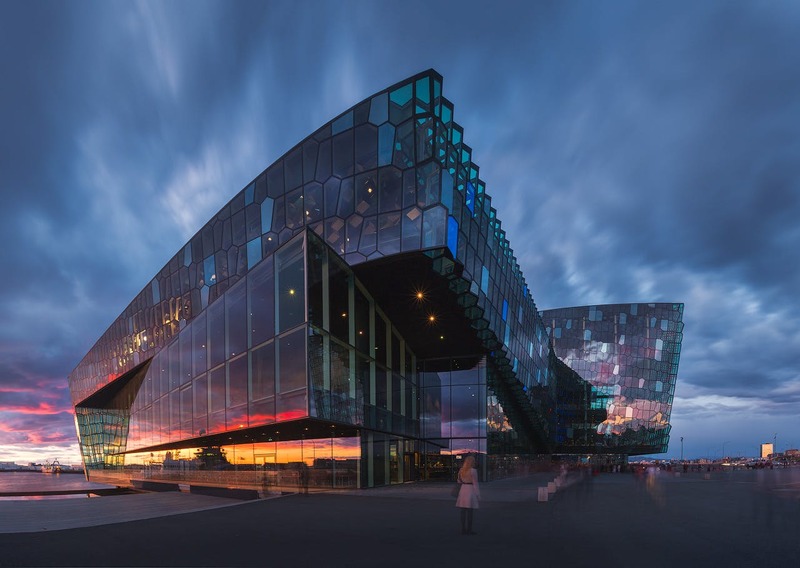 You‘ll spend the night at your Reykjavik hotel. 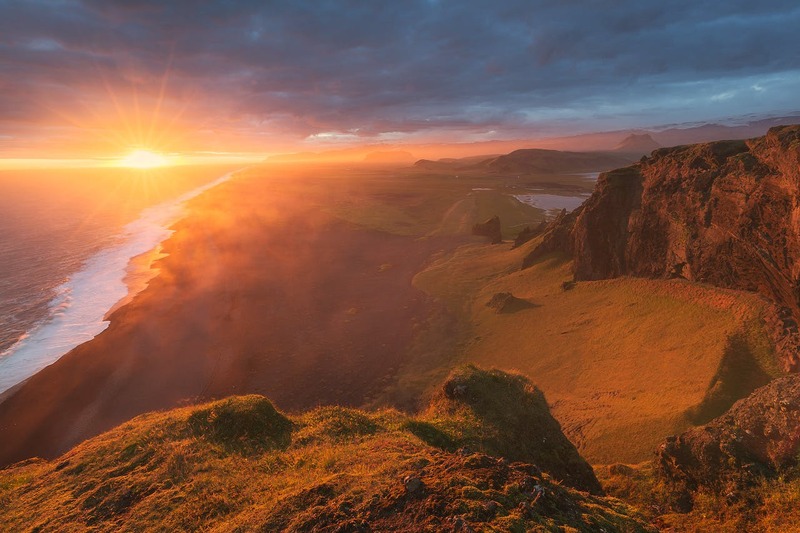 On this day, you‘ll travel the South Coast of Iceland, to visit amazing waterfalls and one of Iceland‘s most spectacular beaches. 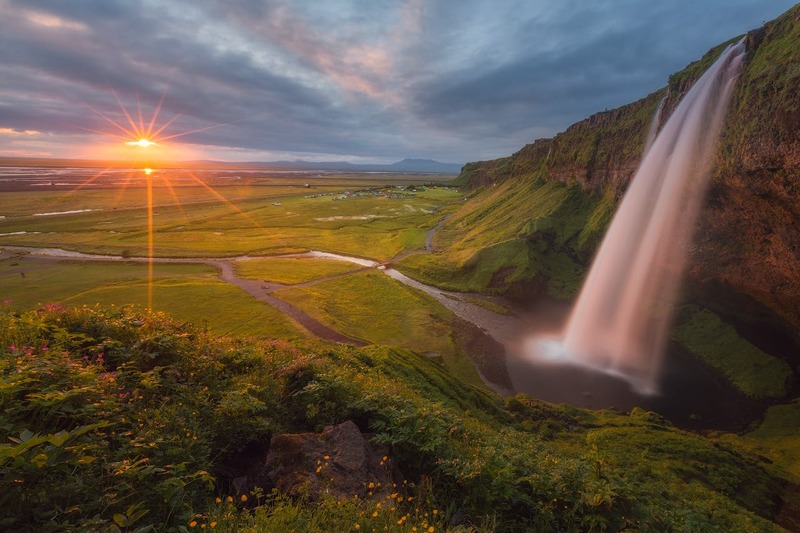 Seljalandsfoss is a narrow waterfall that drops from 63 meters high and is one that you can actually walk behind. Nearby is the 40 m high 'hidden waterfall' Gljúfrabúi, which you'll also be photographing. Its location means that it is often overlooked but it is certainly impressive in its own right and one you can get quite close to. You will then head on to the waterfall Skógafoss, one of the higher falls in Iceland, as well as one of its most beautiful. This waterfall can be photographed from the top, as there is a pathway leading up. 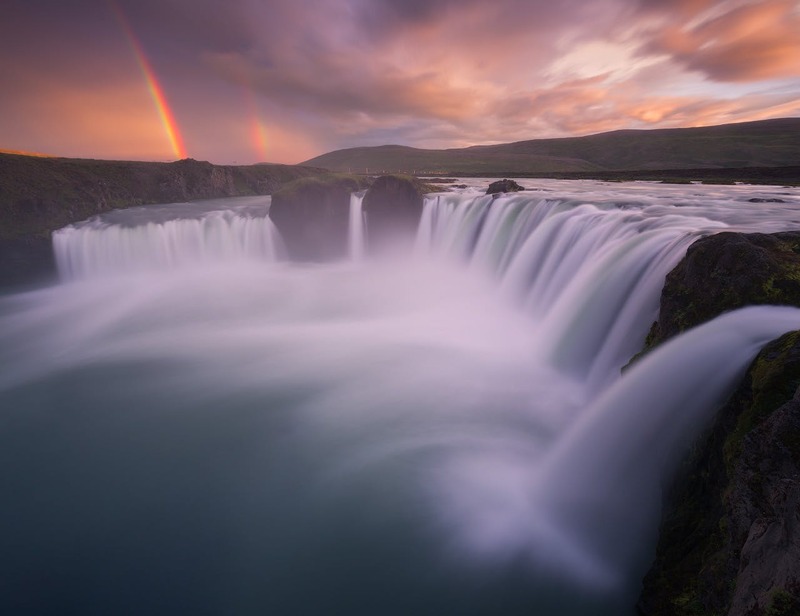 Skógafoss is also known to produce a double rainbow. Next, you‘ll head towards the southernmost part of the Icelandic mainland, the village Vík and its famous beach, Reynisfjara. 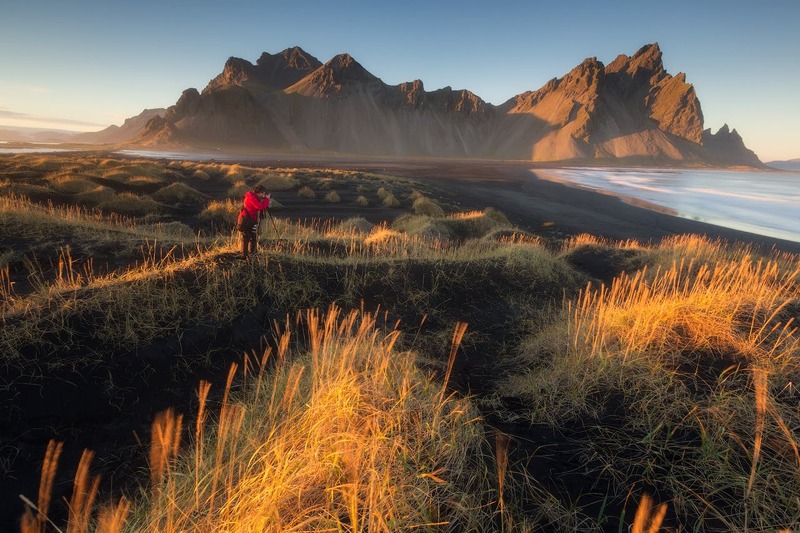 With its dramatic scenery, this beach is a photographer‘s dream. 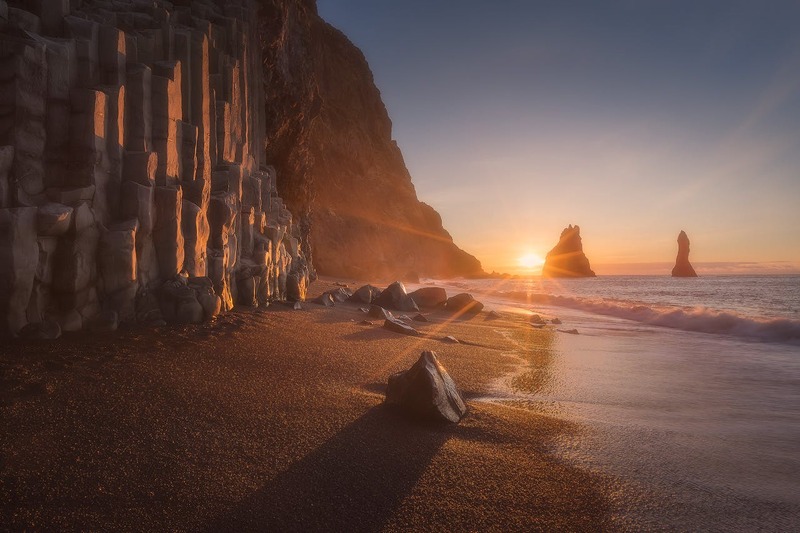 You‘ll have the black sands and pebbles, the basalt column pyramid of Garðar and the impressive Reynisdrangar sea stacks protruding towards the sky from the wild North Atlantic Ocean. There is also a charming lighthouse not far off, at the Dyrhólaey promontory. 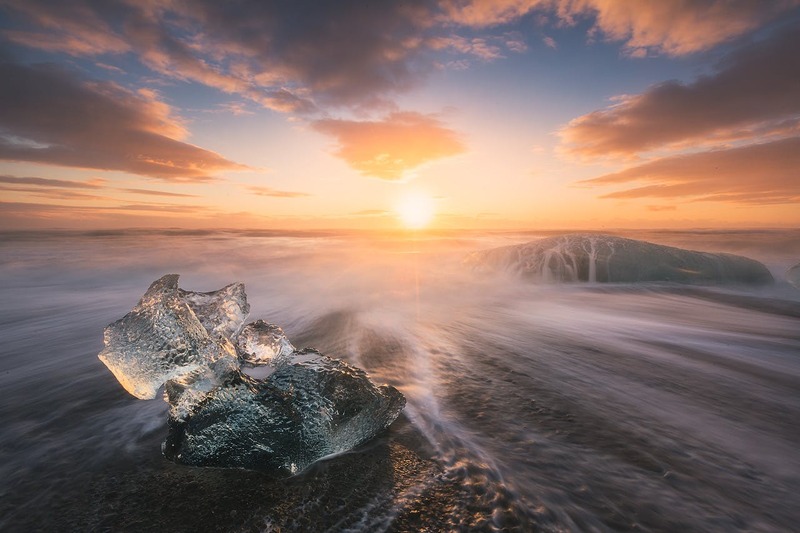 Photographing the beach by the rays of the midnight sun is particularly great, as the twilight gives off a great variety in colours and lends an otherworldly feel to the area. Your night will then be spent at Vík. On this day you‘ll head eastwards and visit the natural reserve Skaftafell, part of the vast Vatnajökull National Park. Skaftafell is a lovely place with lush vegetation and beautiful waterfalls, most famously Svartifoss, with its black basalt columns and wonderful contrasts. 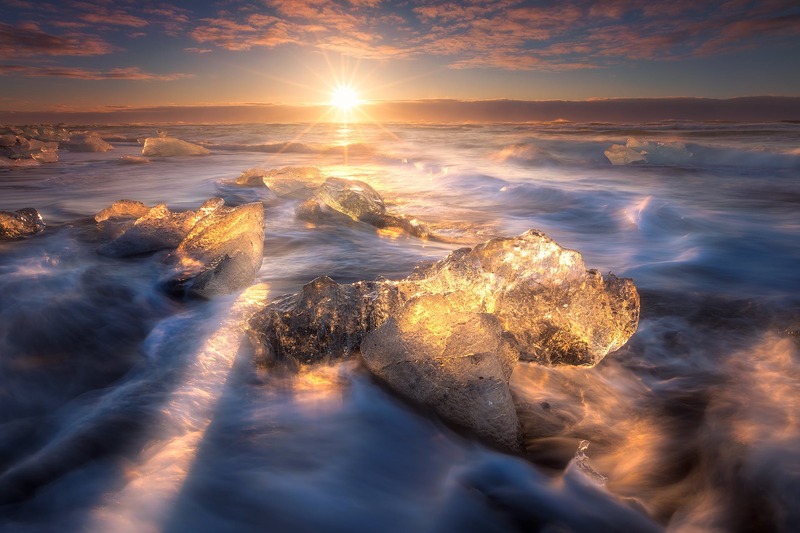 Further east you‘ll also be photographing the amazing beauty of Jökulsárlón glacier lagoon. 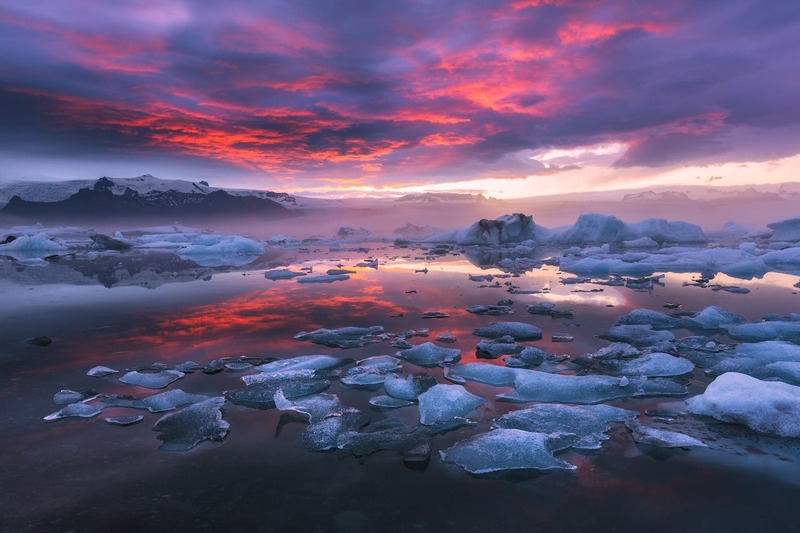 The lagoon is riddled with glistening icebergs of various shapes and sizes that have broken from Breiðamerkurjökull glacier. 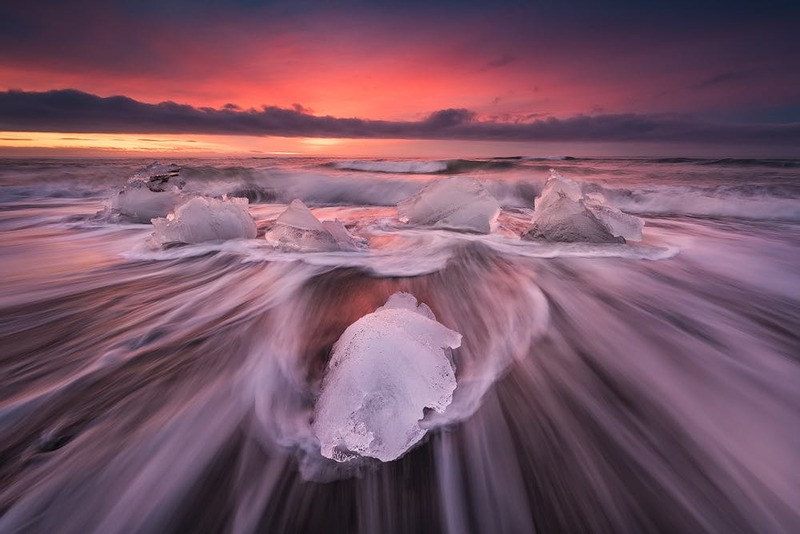 Further icebergs can be found on the adjacent black sand beach. You might also photograph some of the many birds that nest in the area. You will then stay overnight in the area of Skaftafell. On this day you‘ll be travelling north of Mýrdalsjökull glacier, taking the South Fjallabak highland route. This is a volcanic area of dark sands and moss-covered lava, with colourful mountains, mostly rhyolite ones. You‘ll be focusing on two mountains, Öldufell, situated above a green valley with many lovely waterfalls, and the singular Mælifell, a roughly 800 m high volcanic tuff cone, rising like a green pyramid from the dark desert that surrounds it. Another waterfall awaits, the beautiful Axlárfoss in the river Holmsá. Framed with more basalt columns, it‘s a great sight with photogenic contrasts. You‘ll then finish up for the day by enjoying an overlook of the immense volcanic canyon Eldgja. Stretching from the Mýrdalsjökull glacier to the Gjatindur peak, it is over 40 km long, 600 m at its widest and 270 m deep. It was created in a massive eruption around the year 900 and its lava field covers around 700 km squared. Afterwards, you‘ll head for the nearby guesthouse, where you will spend the night. On this day you‘ll be taking a hike to further explore the unique Eldgjá canyon. On your way, you‘ll stop to photograph a beautiful waterfall called Ófærufoss, which falls in two cascades from the North-Ófæra river. You'll then be photographing the crater lakes of Bláhylur and Ljótipollur, both situated in the highland lake area of Veiðivötn. Your night will then be spent at a hotel in the highlands. On this day you'll start out visiting the lovely highland oasis of Landmannalaugar. With its hot springs and natural baths, its colourful rhyolite mountains, its spectacular rock formations, vast lava fields and lush vegetation, the area is one of the most popular and photogenic places in the country. You‘ll be photographing its wonders and travelling the ridge of Frostastaðaháls for a nice overlook of the area, including Frostastaðavatn lake. You'll then be shooting the many beautiful waterfalls of the Sigöldugljúfur canyon. 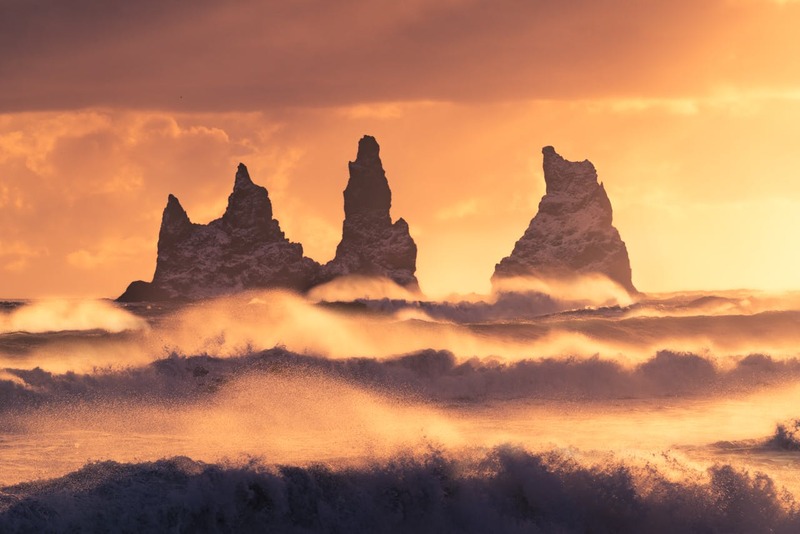 While not as well known as many of the other Icelandic attractions, they are true marvels, and sure to result in stunning photos. The contrast of the green moss, the water and the dark rocks make for a particularly pleasing effect. On this day you‘ll also have the option of bathing in the Landmannalaugar natural baths. On this day you'll return to Veiðivötn and further explore and photograph the area‘s many beautiful highland lakes, its craters and lava. 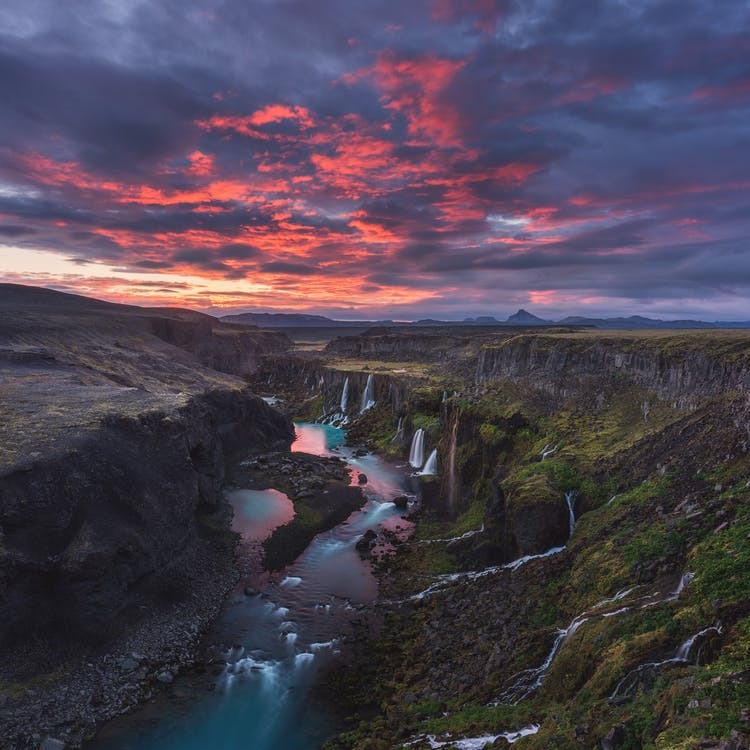 You'll then travel west of the Fjallabak reserve to photograph Háifoss waterfall, Iceland‘s third-highest falls, dropping from 122 meters into a deep river gorge, and its neighbouring falls, Granni. The features are in the river Fossá, itself a tributary of the Þjórsá glacier river, the longest river in Iceland. If conditions are favourable you‘ll also photograph a third waterfall in the river, Hjalpárfoss. This is a two-stepped falls and framed with basalt formations, offering a good photogenic contrast to the whiteness of the water. After photographing these spectacular falls, you'll retire for the night. On this day, you'll be taking a drive through the Sprengisandur highland plateau, which links the north and the south. This was a major route in former times, and three glaciers may be spotted on your way, Hófsjökull, Tungnafellsjökull and Vatnajökull. The route also has strong links to folklore and outlaws were said to have resided in the area, Fjalla-Eyvindur being the most famous. 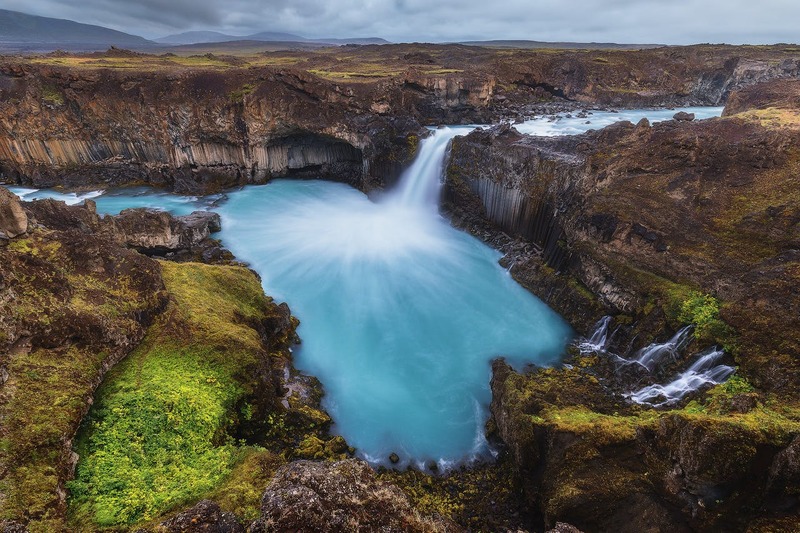 After travelling the route, you'll be photographing three fascinating waterfalls; Aldeyjarfoss, Hrafnabjargafoss and Goðafoss, all located in the mighty glacier river Skjálfandafljót. At the 20 m high Aldeyjarfoss you‘ll have a nice contrast between massive black basalt columns and the whiteness of the water. Hrafnabjargafoss similarly offers a magnificent sight. Lastly, Goðafoss is the most famous of the three, named 'the waterfall of the Gods'. Beauty-wise, the name certainly fits, and legend has it that when an old chieftain and lawspeaker had to settle a religious strife between Christians and pagans around the year 1000, he declared Christianity the official custom by symbolically throwing the icons of the old Nordic gods into the water here. Your night will be spent in the area of Lake Mývatn. On this day you'll explore the amazing scenery of Lake Mývatn, one of the most popular attractions in Iceland. In the lake are many small islands, some of them pseudo-craters. Other interesting rock formations are found in the area, and it is rich in both flora and wildlife. Mývatn is further famous for its natural baths. As with Landmannalaugar, bathing here is optional but not included in the tour fee. 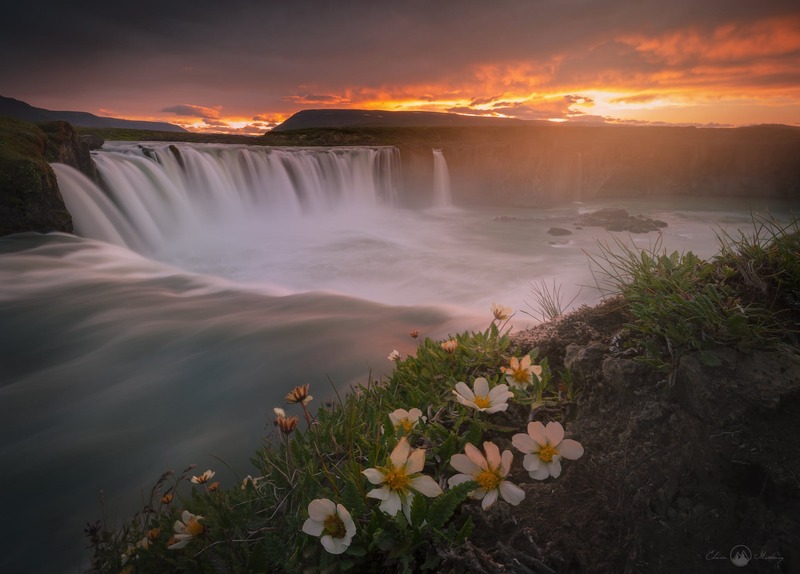 Today, you'll also be photographing the stunning waterfalls of the mighty glacial river Jökulsá á Fjöllum, the most famous of which is Europe's most powerful waterfall, the thunderous Dettifoss. The others, while lower, are still a feast for the eye and for your camera. 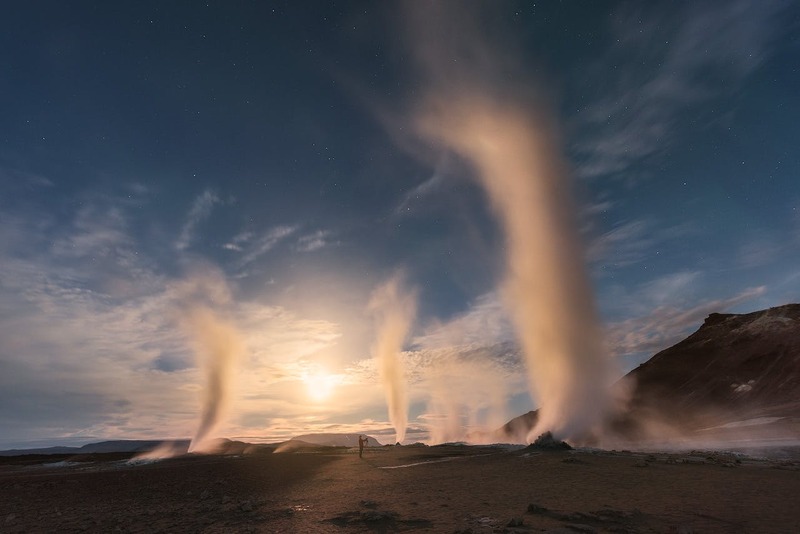 After this, you will photograph geothermal areas, volcanoes and craters. This includes the Námafjall geothermal area, east of Mývatn, where you‘ll find boiling mudpots and solfataras. While a highly photogenic area, it does give off a lot of hot steam, as well as a strong sulphur smell, so please take caution. 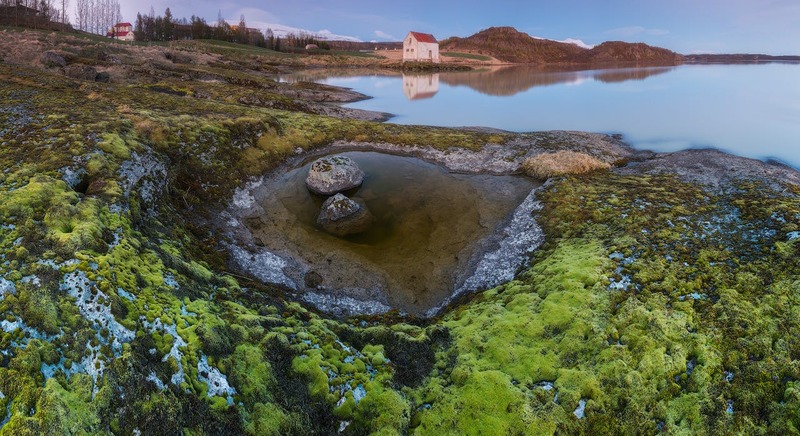 After photographing on this day, you plan to spend the night again in the Mývatn area. On this day you‘ll head toward the Skagafjörður district. This area is well known for its great singers, history and horse culture. The Icelandic horse is a small, sturdy, sure-footed and noble animal, known to be good-tempered and famous for its five gaits. Special respect must be taken for the horses; please don't use the flash, and approach them with the care and gentleness they deserve. As you photograph the turf buildings, you'll get an opportunity to explore one of the country's oldest churches. Inside are some nice baroque wooden roof trims, a rare style in such buildings. An old turf wall lies around the church and its graveyard blends very nicely into the mountainous landscape. Finally, you'll be shooting pictures of the scenic Reykjáfoss waterfall in Svartá river. It is the largest and most impressive falls in the area, great for photography. You'll then spend the night at a guesthouse in Skagafjörður. On this day you‘ll be photographing the impressive and colourful rhyolite mountain range Kerlingarfjöll and the nearby geothermal area of Hveravellir, one of the largest geothermal areas in Iceland. Here you‘ll find hot springs, smoking fumaroles and multi-coloured sinters, and there‘s even a geothermal hot pool nearby to bathe in. You'll also photograph another waterfall, Gygjarfoss. Accommodation for the night will be in the Kerlingarfjöll area. 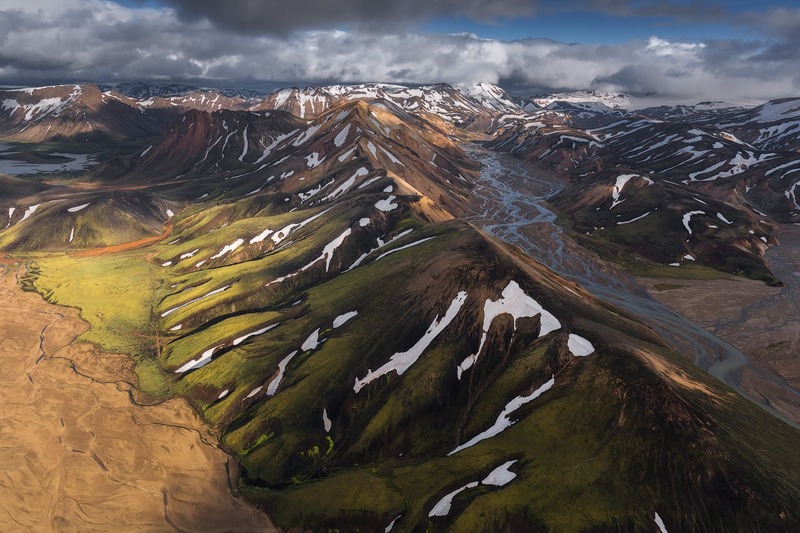 On your final day of photographing, you'll be taking more time to take pictures of the colourful Kerlingarfjöll area. You will then head southwards towards two of the three essential attractions that make up the famous Golden Circle sightseeing route. First up is the magnificent Gullfoss. It is one of the most beautiful and photogenic of all waterfalls in Iceland, falling thunderously from a drop of 32 meters into a narrow gorge, in the Hvíta glacier river. Here you may be able to feel the spray of the water on your face. The other Golden Circle attraction you'll be exploring is the famous Geysir geothermal area. Geysir itself seldom erupts anymore but its neighbour, Strokkur spouts hot water as high as 20 meters every 5 minutes. There is also nice forestry in the area, an old and fragile natural pool and a charming old wooden church. In its diversity and beauty, Geysir is a lovely place to take some stunning photos. 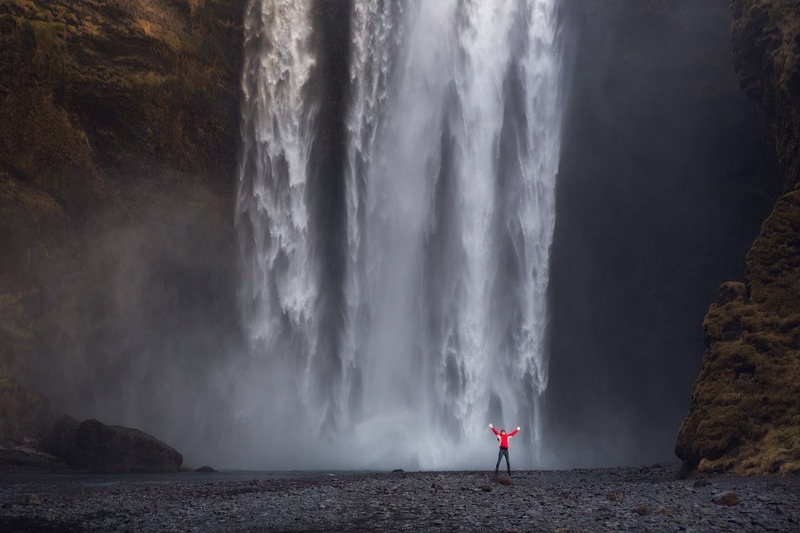 Slightly further southward, you'll be photographing the beautiful Bruárfoss waterfall. This waterfall is really made up of numerous small ones that fall together into an icy blue gap. It is seen as a kind of a hidden wonder, as it’s not immediately visible from the road, but once you‘re there it‘s a real marvel to capture. Afterwards, you'll head back to Reykjavik. You'll have final dinner together and say your goodbyes. Today you will join the FlyBus to Keflavík Airport and leave Iceland.